For most homeowners, there is very little difference between shingles and tile roofing. In the consciousness of most people, both represent one of the pinnacles of roofing refinement and represent everything that a proper, durable, and worthwhile roof should be. Contrary to common belief, there is a very distinct difference between tile roofs and roofing shingles, although this don’t always come out as evident, thanks to the blurred lines that ascribe the term ‘shingles’ to standard tile roofing. In a nutshell, both are generally similar in that they are similarly employed as a type of roofing material, often even showcasing similar traits or appearance, but they are not the same; appearance is where the similarity ends. 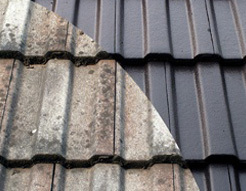 The real difference between shingles and tile roofing is that shingles are often made from some type of rock or similarly hard mineral, generally, but not limited to: granite, limestone, gneiss, and marble, whereas tile roofing is made of an assortment of organic matter which is made into a slurry, shaped, and fired in a kiln. Where shingles tend to be significantly impermeable to water, some type of tile roofing actually feature porous tiles. Shingles are made of thin slices of stone shaped into a tile, but tiles can be clay-based, glazed or unglazed, or even made from porcelain. While both shingles and tile roofing have a tendency to be on the pricier end of the spectrum, tile roofing is generally marketed as more affordable than old-fashioned shingles. Of course, there are some clear-cut advantages to tile roofing that shingles simply do not have. 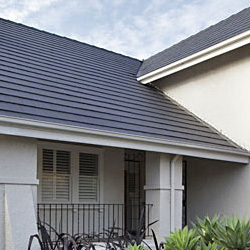 Tile roofing is sometimes considered the more ‘affordable’, and unfortunately assumed ‘inferior’, end of the roofing spectrum, with a preference geared more towards shingles. This is due, mainly, because homeowners honestly are unaware of these differences. Contrary to popular belief, tiles are actually far more superior to shingles, and not just because they’re ‘affordable’, but also because they’re versatile. Unlike shingles, which come as-is and whose aesthetics is solely limited to its rock type, tile roofing can come in a wide array of colours, shapes, and finishes with one bound to satisfy your specific design needs. 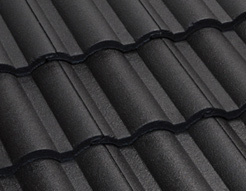 Tile roofing is also considerably lighter than shingles, requiring lesser reinforcement when installed on roofs. Because they’re technically a kind of ceramic, repairing tile roofs with grout or putty is easy – compared to the often tedious need to replace shingles each time they are damaged. There are other benefits and difference between tile and shingle roofs, and property owners that are in need of re-roofing, roof repair, or planning to install a new roof are advised to consult a roofing professional, to learn more about their roofing options.